When you pull this warm strudel from the oven, everyone will think it took hours to prepare. Not true, because this recipe uses puff pastry sheets and canned pie filling. 1) Heat the oven to 375 degrees F Beat the egg and water in a small bowl with a fork or whisk. 2) Unfold the pastry sheet on a lightly floured surface. Roll the pastry sheet into a 16 x 12 -inch rectangle. With the short side facing you, spoon the pie filling on the bottom half of the pastry to within 1- inch of the edge. Starting at the short side, roll up like a jelly roll. Place seam-side down onto a baking sheet. Tuck the ends under to seal. Brush the pastry with the egg mixture. Cut several slits into the top of the pastry. 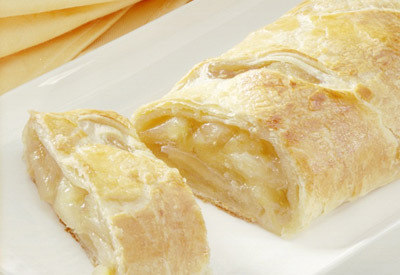 3) Bake for 35 minutes or until the strudel is golden brown. Let the strudel cool on the baking sheet on a wire rack for 20 minutes.